This glass tempering furnace cleaning device removes dirt, glass and other particles adhered to ceramic rolls. 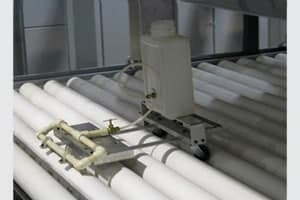 The roll cleaning machine uses a diamond hone to resurface and polish the surface of the ceramic roll without having to remove it from the tempering furnace. Machine power is provided by the rotation of the furnace rolls and uses only water to flush the diamond hone throughout use. 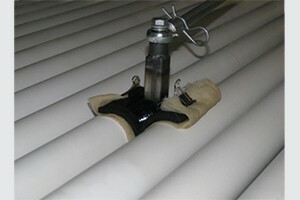 The roll cleaner only requires one operator and can be used in conjunction with other furnace cleaning methods. The HHH roll cleaner can be used with a variety of other manufacturers’ furnaces. Purchase a roll cleaner to fit your furnace by completing the form below with your roll diameter and center to center distance between ceramic rolls.